Plans change. Even a well thought out idea may change before or during its implementation. The design for the Saint Joseph's Oratory in Montreal, Canada changed between 1922 and when it was completed in 1967. Of interest to souvenir building collectors are the many replica versions created over the years for what was envisioned to what was ultimately constructed. A seven-inch-tall version from 1926 reveals the changes. The top center dome is drum-shaped and the four surrounding towers are thinner than what was built. The stairs are the same, but platform at the bottom of the stairs was also redesigned. Around the base is written: “La Future Basilique. Oratoire St. Joseph Du Mont Royal Montreal Canada. Fabrication Francaise Copyright by 1926 – Depose- M.P.” I wrote to Jean-Francois, the archivist for Saint Joseph's Oratory, who said, “The original design for the dome was more narrow. In fact, the 1922 plans by architects Viau & Venne depicted a more luxious and classical dome, with colonnade and statues. The year 1926 corresponds to the beginning of construction for the future basilica. So, the miniature scale ba silica dated 1926 may be linked to that construction. We don’t know for sure if they were given as souvenir to dignitaries or put in sale in our gift shop. We know that several of these were made (but they are quite rare today).In 1934, one of the two architects died (Venne). It was a time of economical difficulties and the original design for a somptuous dome was not welcomed anymore. In 1936, the Shrine’s authorities then asked Dom Paul Bellot, a reputed architect monk, to redesign the dome’s shape to have it lower, less expensive to build and more in the spirit of the time." Construction of the real Roman Catholic Italian Renaissance style Basilica began in 1924 based on plans by Montreal architects Dalbé Viau and Alphonse Venne. The dome was poured and covered with copper. With a diameter of 39 meters (125 feet), The basilica dome rises 236 meters (856 feet) above sea level making it the highest point in the city of Montreal. Aviation authorities require that the cross on top be illuminated. The interior was completed in 1966, based on on designs by the Canadian architect Gérard Notebaert. With a seating capacity of 2200 people, the Basilica gets two million visitors and pilgrims every year. Other building replicas came in various sizes and materials, but all resemble the church as it appears today with a more football-shaped dome which recalls the Duomo in Florence. 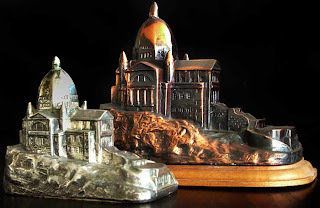 Versions include those made in occupied japan, pot metal and pewter, encased in Lucite and even some painted. Do you know of additional versions of this church? 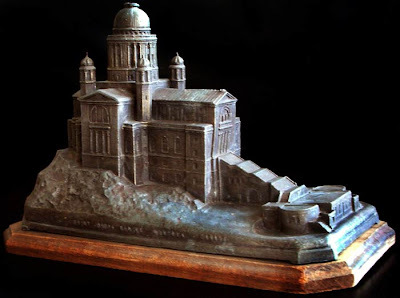 Do you know of other souvenir replicas which have versions of ‘as planned’ and ‘as built’? Yes, that's true they do look similar. I'll investigate Lourdes for a future post. Does anyone know what the finish was on this building? I have one that appears to have had a brown stain applied but I am not sure. If you're refering to the top photo - the large 1926 replica - this has a dull brown finish. The one in my collection has some ares which the finish has worn away and it also has some faint gold highlights. I have not seen too many, but I don't believe it ever had a high-gloss finish.